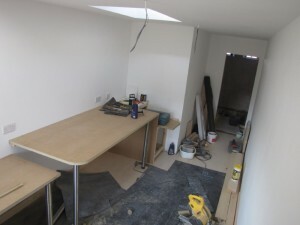 The first area that we are having handed over will be the studio above the new kitchen/diner. This is tantalisingly close to completion now. 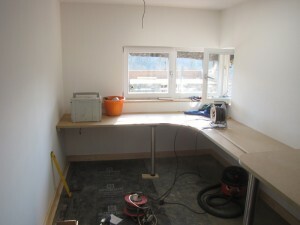 The flooring is in, walls are painted and the work desk and bench almost complete. 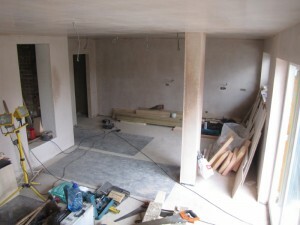 Electrics have been second fixed and the heating and plumbing for a sink will go in shortly. Yes, I know I’ve taken a break from updating this blog for two or three weeks, but things have been a tad busy with work, so apologies for that. A lot has happened since the last update. 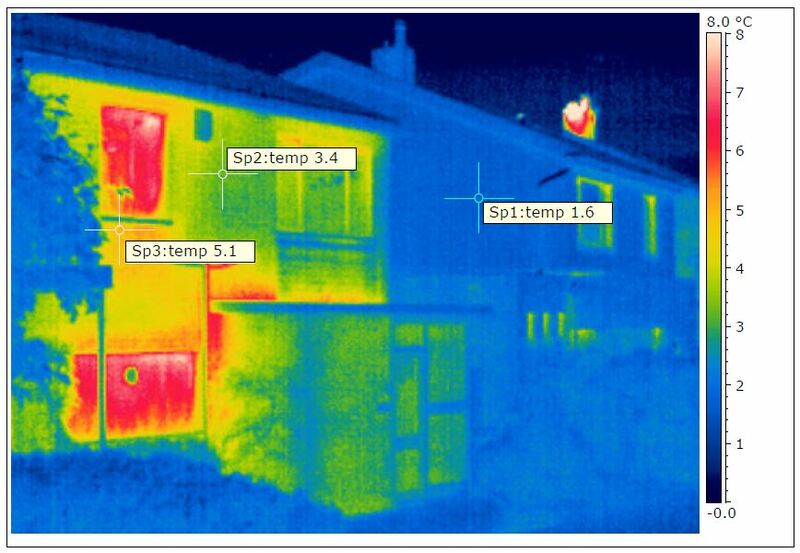 Most of this has been on the internal plastering and the external rendering. 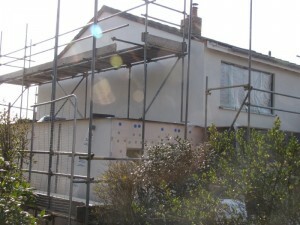 Externally, the house and extension have now been rendered with two coats + mesh of Parex render base. The top coat – a through colour layer will be added next week, although the colour is only a shade different to the base layer. 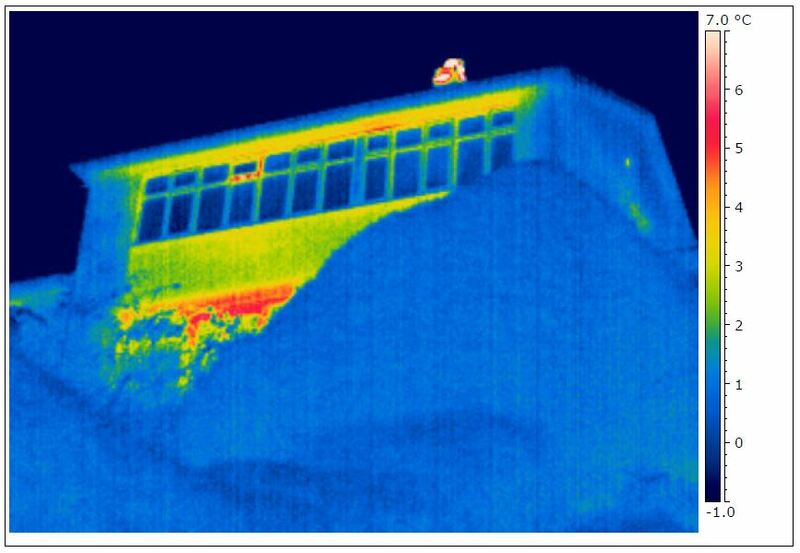 As we have insulation down to ground level, the render will continue below the drip profile rail, but this will be after the scaffolding has been removed. So far it looks good. The area around the front door (covered in a black wind check barrier) will be clad in sweet chestnut, which should also be added starting next week. Plastering has gone really well. 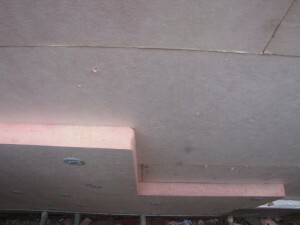 We have used a local plasterer, recommended by our builder, and the quality of his work and pace is quite exceptional. 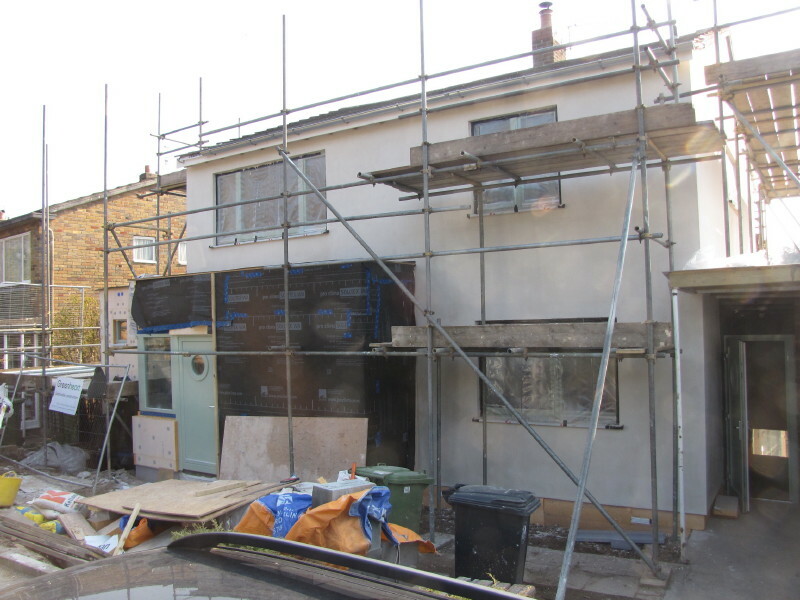 In the three weeks since the last blog post, he has managed to plaster the entire extension area + a bit of extra work in the existing house. 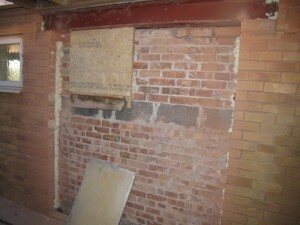 The photo above right shows the staircase now installed. 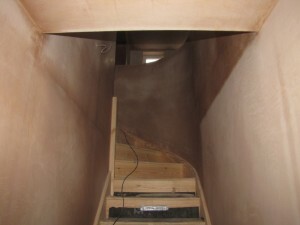 This was also put in during the last three weeks and it looks great – it is a softwood stair with a curve formed for the turn at the top – the joiner has done a beautiful job, which is complemented by a curved wall, plastered to perfection. 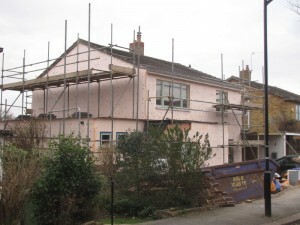 The external insulation progressed well (until we ran out) and the house is beginning to be transformed. 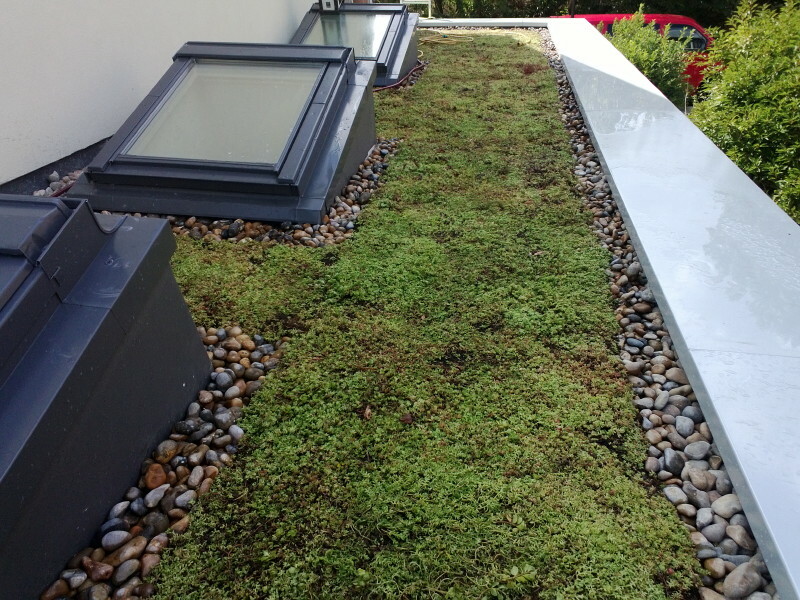 I’m sure we’re the talk of the neighbourhood – ‘what on earth are they doing?’ Weather permitting, the rendering will start next week. and it will begin to look a bit more normal. 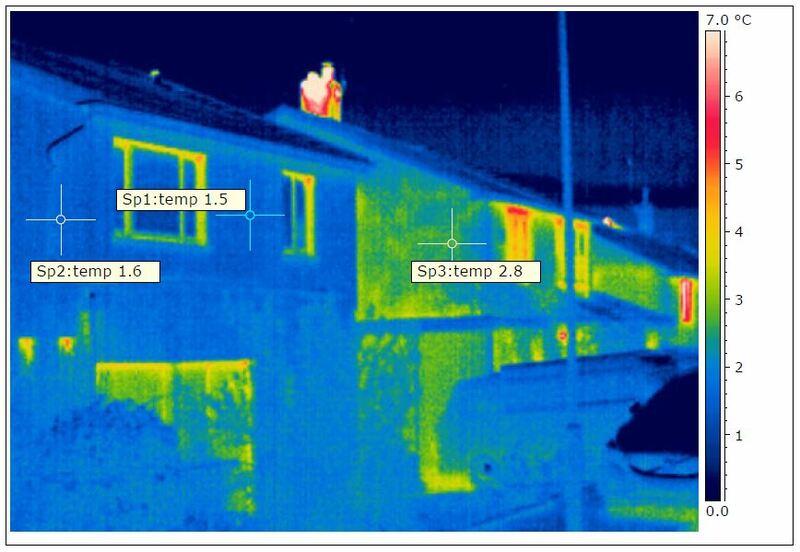 Another week, or so and the insulation should be complete on the external – a fair bit to do on internal insulation works – particularly suspended floor and loft. 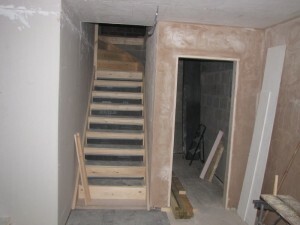 The new staircase was installed over the last couple of weeks. 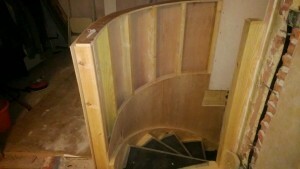 We were keen to have a curve on the turn on the stairs at the top and the joiner has made a lovely job of it. 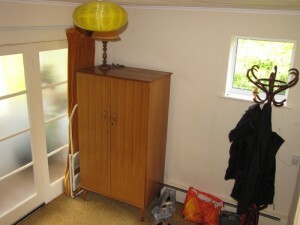 As the photo top left shows, the carpenters have started to build a curved wall from the hall to wrap around the stairs. 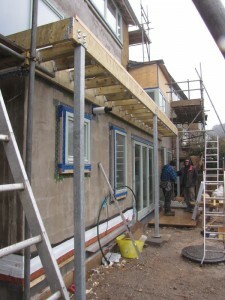 Access to our new extension at last – feels like we are getting nearer to the end of the build now! 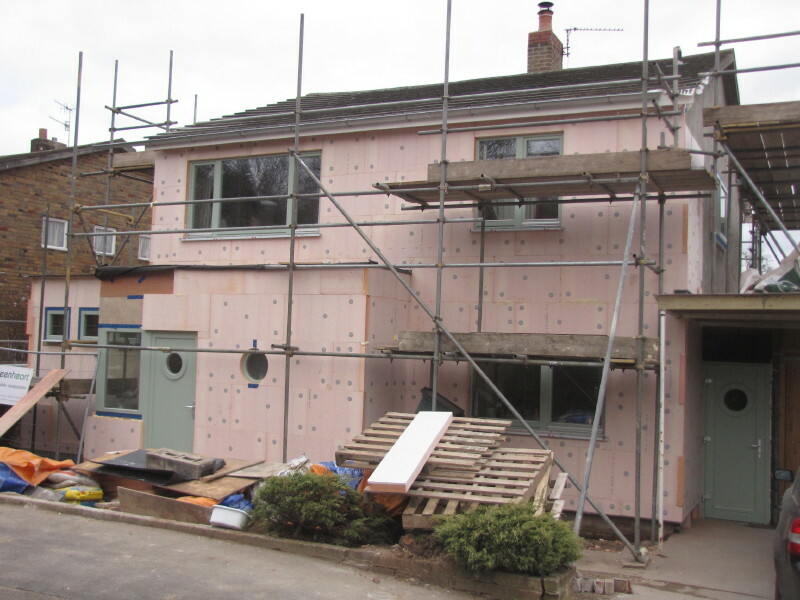 Having been delivered some 6 weeks ago (see earlier post), the external wall insulation is now starting to go on. 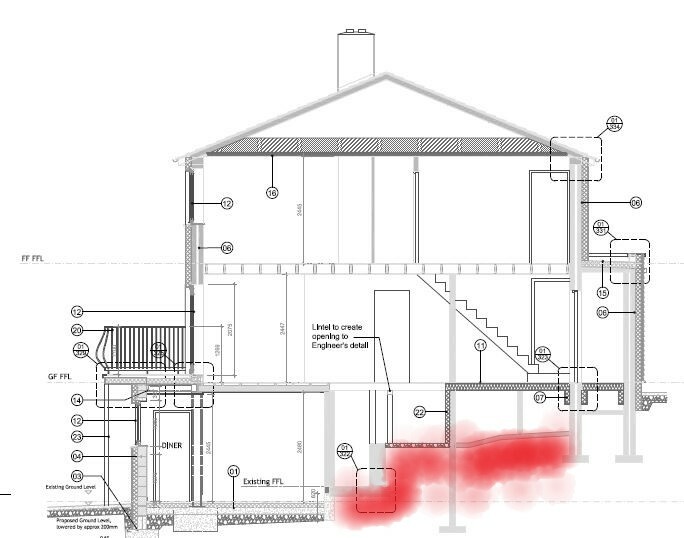 Starting with the extension late last week, but in earnest this week to (almost) complete some 80m² of wall area. The main (original) house is left to do, it should be done in approximately 3 weeks time if we manage to keep this pace up. 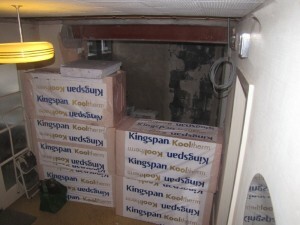 We are using two layers of Kingspan K5 insulation boards. 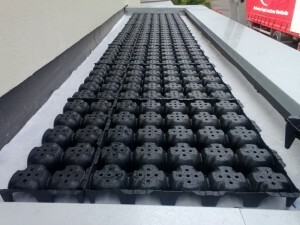 These are 60mm thick giving a total of 120mm external insulation. 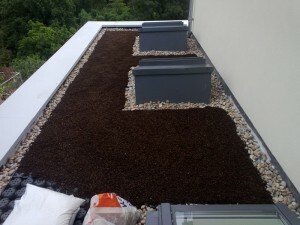 The first board gets bonded to the wall using Knauf Marmorit SM700. 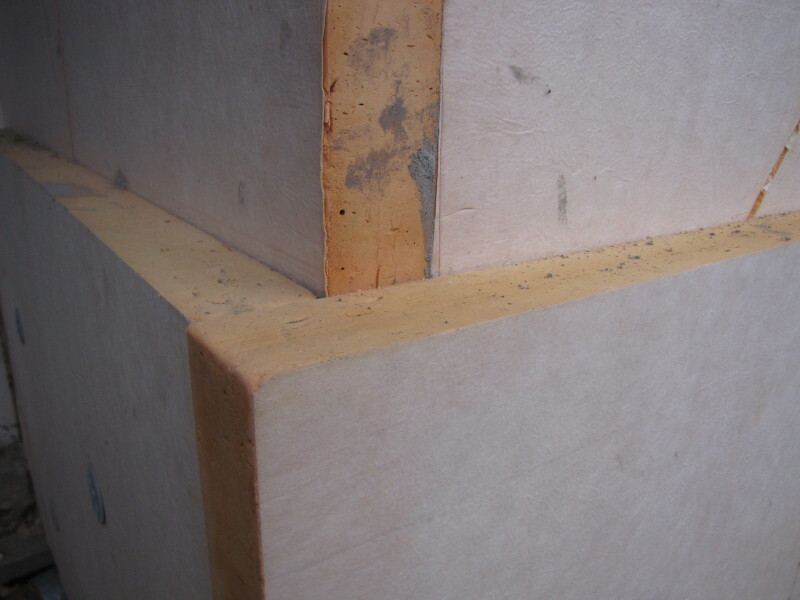 After this has gone off, the second insulation layer is applied with the boards offset in order to cover any air gaps between boards in the first layer. 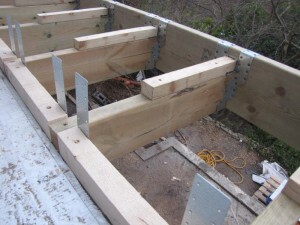 This second layer is mechanically fixed using thermally-broken fixings through both boards and into the masonry. 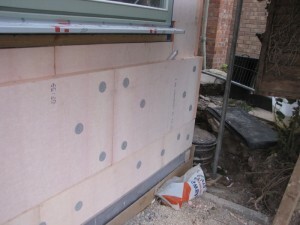 The wall insulation will eventually be finished with a mix of through-colour render and splayed chestnut timber cladding. In the meantime the house will look like a marshmallow! 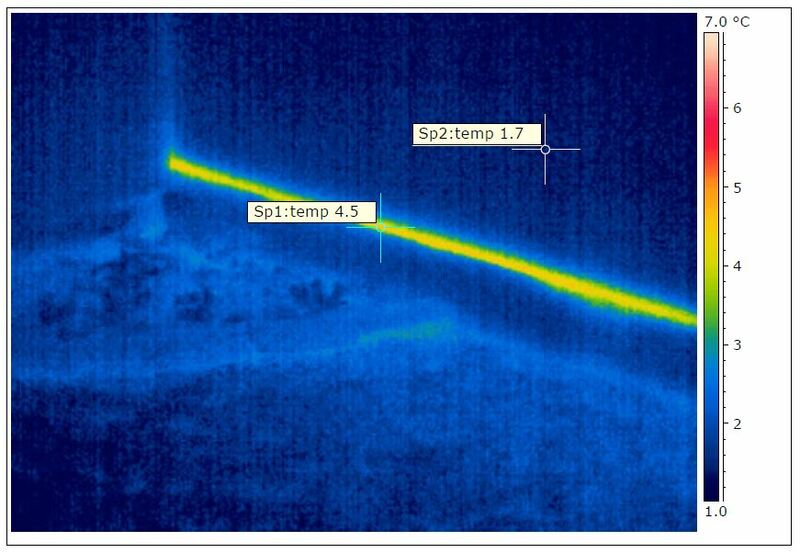 A better picture of the breakthrough will replace the photo (above right). 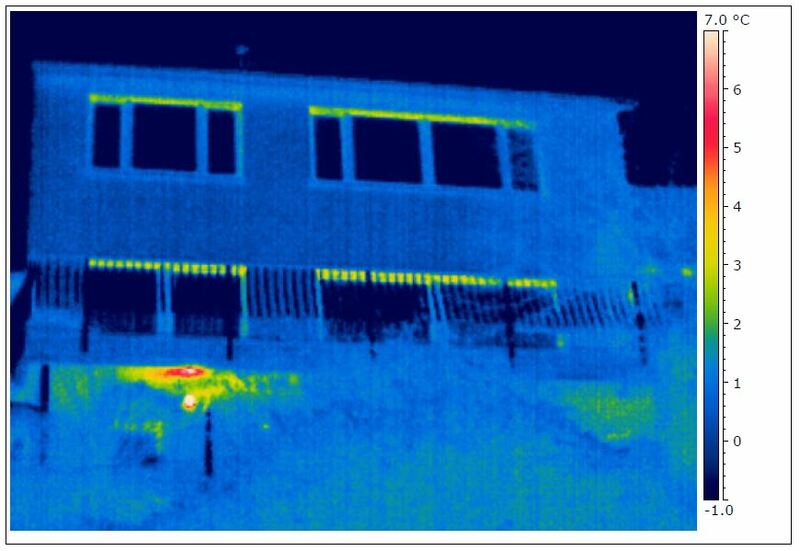 And, yes, I know it’s an odd place to put insulation, but until the stairs are in (next week), we need to keep our inquisitive dog out of the way.